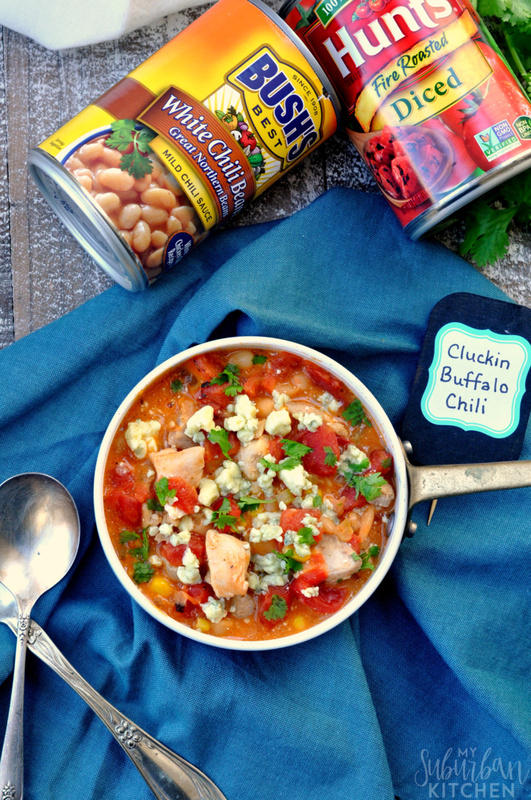 Buffalo Chicken Chili - An Easy Buffalo Chicken Recipe! I am so excited to partner with Hunt’s and BUSH’s to bring you this chili recipe. While this post is sponsored, all thoughts and opinions are my own. Nothing beats a bowl of Buffalo Chicken Chili on a cold day. Make it on the stove top or in the crockpot for a easy and super delicious comfort food option! It is totally chili season here. From cold temperatures to lots of time spent watching football and other sports, there is nothing like a big bowl of chili for lunch or dinner. 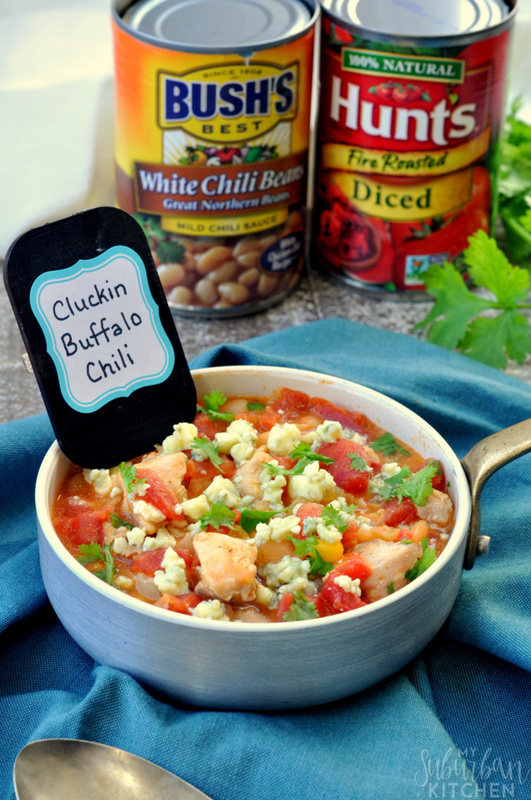 I like to show our Chili Pride by making our favorite Coe’s Cluckin’ Buffalo Chili (or Buffalo Chicken Chili)! 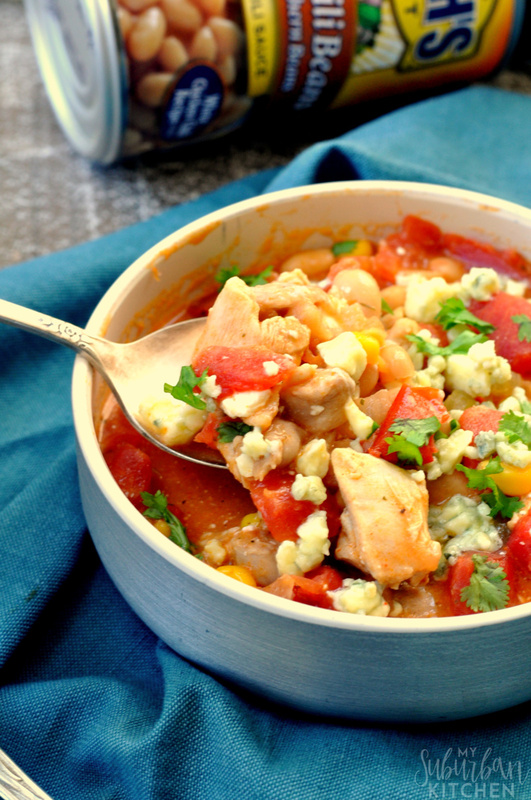 This healthy chicken chili combines all the flavors of our favorite game day food into an incredibly flavorful bowl of chili that can be ready in 30 minutes or simmer for hours depending on what you need. The secret to my Buffalo Chicken Chili is that I only use Hunt’s vine ripened tomatoes and BUSH’S slow-simmered chili beans. Specifically I use Hunt’s vine ripened fire roasted diced tomatoes and BUSH’s slow-simmered white chili beans. They are the essential ingredients to any great bowl of chili! This chili is absolutely perfect for a cold, winter day or anytime you want a hearty meal that doesn’t require a lot of prep work. 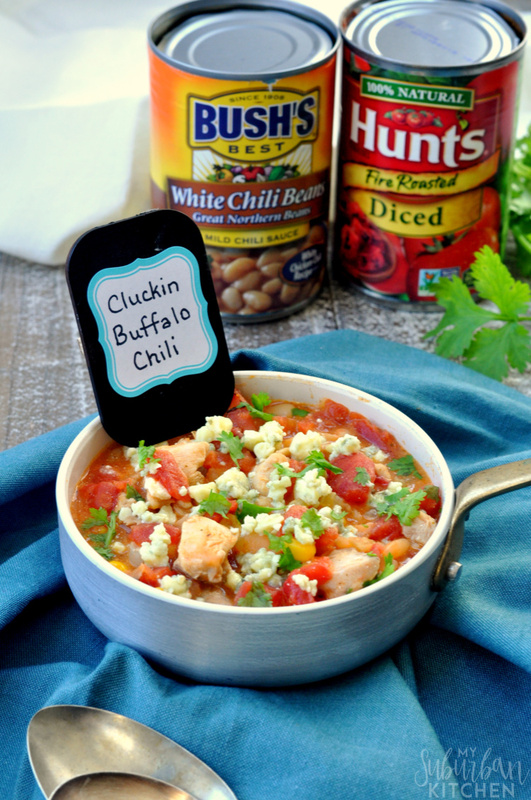 Of course, with all the great sports games coming up this winter, it is the perfect time to show your Chili Pride and make a bowl of Coe’s Cluckin’ Buffalo Chili! It is sure to be a big winner! This can be easily made in the slow cooker too! Simply sauté the onion and celery in step one. Then, combine everything except for the cream cheese, blue cheese and cilantro in the slow cooker and cook on low for 3-4 hours. Stir in the cream cheese about 30 minutes before you are ready to enjoy the chili. What are some of your favorite chili recipes? Whenever you start making chili, just be sure to get the two essential ingredients for the best tasting chili on the planet: Hunt’s vine ripened tomatoes and BUSH’S slow-simmered chili beans. In a large pot, heat oil over medium heat. Add onion and celery and saute for 3-4 minutes. Season with salt and pepper. Add chicken and cook for 5-6 minutes or until all of the chicken is browned. (Note: it does not need to be cooked through) Stir in buffalo wing sauce, ranch seasoning and chicken broth. Drain one can of Hunt's vine ripened fire roasted diced tomatoes and add the tomatoes to the pot. Add the other can of Hunt's vine ripened fire roasted diced tomatoes undrained. 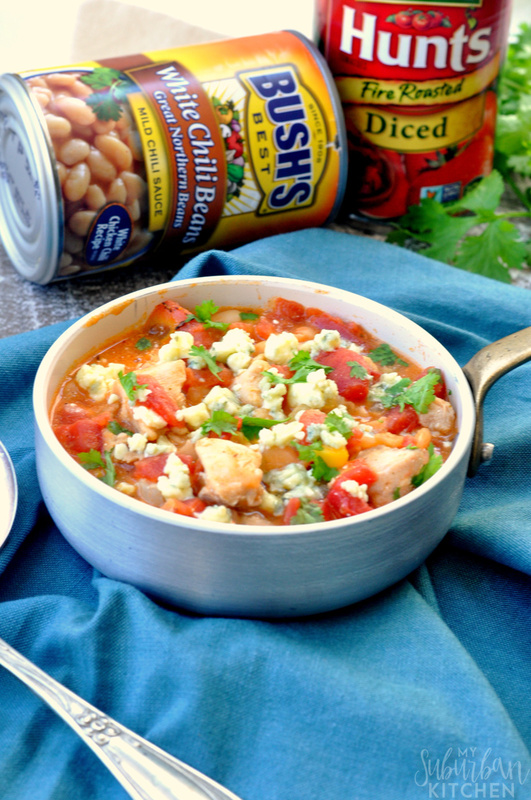 Stir in both cans of BUSH's slow-simmered white chili beans. Bring to a boil and lower heat to simmer. Simmer for at least 15 minutes or up to 4 hours. Stir in cream cheese just before serving. Top with crumbled blue cheese and cilantro. This looks so hearty and delicious! On my to do list! Love this twist on chili! Looks like delicious twist on chili. Such a wonderful combo, looks spicy and yum!